OM VISA Consultancy - Global Immigration, Students, Visitor, Business & Work VISA Consultants: Study At the best Colleges in Germany with OM INTERNATIONAL...!!! 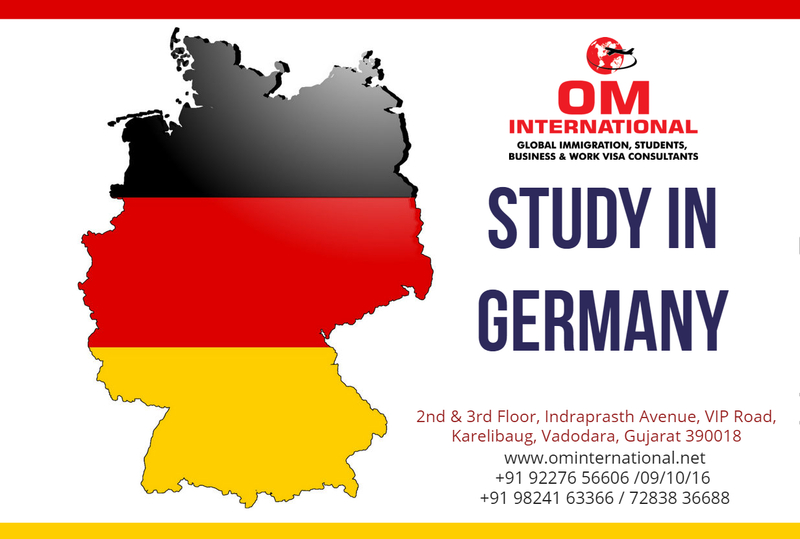 Study At the best Colleges in Germany with OM INTERNATIONAL...!!! OM INTERNATIONAL Consultant is established to be an ultimate choice for students who wish to enrich their academic career by studying overseas in top global institutions. Its sole objective is to provide impeccable guidance to students, by simplifying the process. OM INTERNATIONAL Career Consultant gives individual attention to each student, guiding them in every step of the process. No wonder, all our students refer their friends.OM INTERNATIONAL Visa expert make sure that once student gets visa, he / she settles down well in the country. We keep in touch with our students abroad, so that we continue to support them, whenever required. Germany is slowly emerging as one of the most popular destinations for students from all over the world. More number of students is showing an interest in Study in Germany over the recent years. Hitherto students had only shown an interest in studying in destinations such as USA and Canada; however it is important to know the right points to consider when selecting a university in Germany. The first thing that a student needs to consider is to zero in on the course and the university he wishes to apply for. Germany has more than 2011 courses available for international students at universities situated across the country. Most courses in Germany are taught in both English and German. If you have studied German as a part of your schooling and are up for the challenge of learning in a new language, by all means go for studying in German. However most international students prefer to get the best of both worlds by opting for a high standard German course in a language you are comfortable with. It is important for students who will apply to Study in Germany, to check the ratings as well as the rankings of the university that they are planning to apply to. It is well worth knowing the conditions of the classroom as well as other infrastructure. There are a number of independent agencies as well as government websites that provide students with details about the study conditions in different universities in Germany. One of the most important factors in your choice of a university in Germany would be the location. If you are a student from India, then you would want to apply for universities in cities like Berlin or Cologne where there is a sizable Indian community and you would be able to procure Indian food without much trouble. In Germany, different universities have different intake periods. Some universities accept new students only for the summer semester, while others do so only for winter. Some universities even accept students for both the semesters. It is important to check when your preferred university will accept you for admission before you apply. You also need to have a clear idea about admission requirements as well as deadlines so that you can apply in advance. 6. Take a look at the costs and funding options. The cost of tuition as well as the cost of living while you pursue your course of Study in Germany would be a major factor in deciding which university you want to go with. The cost of tuition can be offset by choosing to go with public universities, which offer free tuition. But even in this case you would need to bear incidental expenses such as cost of books, rent costs, groceries and other living expenses. You also will need to check if any financial aid is available from banks or the university itself. If you are an outstanding student and can prove your merit with superior scores then you can apply for a DAAD scholarship or a university scholarship to help ease the burden on your purse-strings. For more information on applying to a German university, reach out to our expert overseas education consultants at OM INTERNATIONAL.